Aerial View of the $150 Million Hotels and Conference Centre to be Built at the Brisbane Airport. Watpac Limited has signed a lucrative $78 million contract with developers Flynn Property Group and Scott Flynn Properties to construct the $150 million hotels and conference centre at the Brisbane Airport. 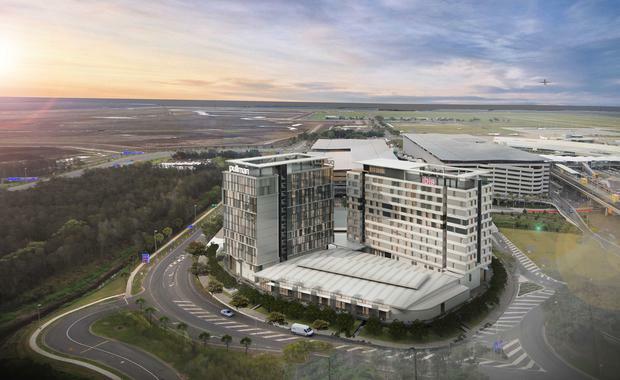 The development is slated as the airport's largest external development featuring a 5-star Pullman Hotel, a 3.5 star Ibis Hotel and the Brisbane Airport Conference Centre. Flynn Property Group Managing Director Anthony Flynn and project partner Scott Flyn from Scott Flynn Properties were looking forward to having Watpac onboard for the Brisbane development. "Not only is this $150 million development the biggest third party development project ever undertaken at the Brisbane Airport, it's arguably the best hotel opportunity on the east coast of Australia," Mr Flynn said. "It's strategically located at the centre of a bustling airport with exposure to more than 22 million passengers annually and is highly accessible from across Brisbane by road and rail," he said. The development is set on 7,826 square metres in the airport's Domestic Terminal Precinct along Dryandra Road. It will include a mix of 373 suites across the hotels as well as 1,735 square metres of conference, meeting and event space in the connecting conference centre. With major works to start in May 2015 and finish mid-2017, it is estimated that 1,000 jobs will be created during construction. Watpac Limited Managing Director Martin Monro said he was thrilled with the partnership and was looking forward to delivering the large-scale development for Brisbane. "We are proud to be involved in the delivery of this exciting project which will shape what is essentially the gateway to Brisbane," Mr Monro said. "This project is a great addition to our workbook and will draw upon Watpac's national experience in delivering luxury, high quality hotel developments." The development is the Flynn brothers' second Brisbane Airport hotel investment after opening the 157-room Novotel Brisbane Airport at Skygate in 2009. "The addition of our internationally recognised Accor-branded 5-star Pullman and 3.5 star Ibis Hotels to the existing 4-star Novotel Hotel, will mean Brisbane Airport will have the full spectrum of full-service branded hotel accommodation options covered, from quality affordable to upscale international," Mr Flynn said.